Be it Sachin Tendulkar fainting in his hotel room after dinner or Harbhajan Singh slapping his team mate, a huge furrow over cheer leaders or TV channels discussing T20 over one day matches, cricket finds its way to the top stories of the day anyhow. The second in league should be Tennis with talks about Sania Mirza’s engagement party or rift between two senior players. But rarely do we hear about certain karate championship or find these champions during the prestigious Rajeev Gandhi Khel Ratna Awards. “We mostly stay in places (government schools, temple compounds, etc) where there are no toilets and we have to walk miles to get food,” M G Prasad complains. Pic: Supriya Khandekar. One such name that did not get much notice is 34-year-old M G Prasad, a nine times international Karate award winner residing on old Airport Road/HAL area. The recent feather in his hat was winning a gold medal for India at the 29th Karate-Do Goju-Kai Singapore Annual/Invitational Championship 2009 in September. This was the only award India won at this international championship where India participated in at least in 32 events. “It feels great to stand with the Indian flag and a gold medal around your neck. You feel patriotic, you feel proud to bring glory to the nation,” says Prasad with his glowing eyes as he sees the photographs of the championship. But the joy is short-lived for champions like him who hardly get any recognition back home. He further describes how he had to send a note to all the media houses to write about this championship, “Everyone declined to write because the Karanataka Premier League (Cricket) was on.” (The Hindu reported this on October 7th, very briefly). Prasad also owns and runs Zen Martial Arts Academy (at Jagadish Nagar, Thippasandra) where he teaches Karate and Tai Chi. At the same time he is working at school gymnasiums, Sports Karate Association at Kanteerva Stadium(recognised by the Government of India and Indian Olympic Committee) as a public relations officer and working as a Karate Teacher in BEML School (Thippasandra) and Air Force Officers Enclave(HAL area). He is also a personal fitness trainer to a lot of IT employees from Wipro, Infosys, so on and trains them at his classes on Sarjapur Main Road and Palm Meadows, Whitefield. He also gives fitness training to national level swimmers and tennis players. In a conversation with Citizen Matters, Prasad explains the plight of Karate players in India and says that for every national level championship the players are put up at places with no proper facilities. “We mostly stay in places (government schools, temple compounds, etc) where there are no toilets and we have to walk miles to get food,” he complains. He says that players are not treated with dignity and lack of facilities results in bad performances. His concerns go beyond just players not getting money. He explains that the All India Karate Federation(AIKF), the governing body of Karate on the National level gets only Rs 30 lakh per annum to maintain and fund championships throughout the year. This amount he says is further divided into respective states and from there to the district associations. At the same time he expresses his anguish and says that the Government of India never sponsors any of the championships be it national level or international level. It is totally up to the participants to arrange for funds. “Most players do not come from affluent families so all the players have to hunt for sponsorships from somewhere and if they do not get any sponsors then they miss the event,” he explains. “For any championship some of the top players from each state are selected by the selection board but finally who goes to play depends on who manages to get the money or who manages to bribe the selectors. Sometimes players who were not selected also go for the championship and come back with no awards,” he adds. Referring to a recent karate championship in South Africa he says that none of the players that went were selected and nor were top level players. As a result India came back with no medals. The All India Karate Federation(AIKF) gets only Rs 30 lakh per annum from the central government to maintain and fund championships throughout the year, according to M G Prasad, gold medal winner. “The amount is less than what a cricketer gets as his payment for one match. We get this for an entire year for players of the entire country,” expresses his anguish. He feels that the fault doesn’t lie only with the AIKF in not providing facilities for the players because they are short of funds. According to him unless a karate player goes abroad to play at least once he would not understand about the facilities available. Ask him about parents not promoting their children for karate and he immediately responds, “Who wants to play and get hurt?” He feels that unless karate is given importance improvement in this sport is next to impossible. “For how long can private sponsorships from friends and well wishers work? We need more to survive at the international standards. Indian players are very talented but lack of training facilities goes against their win at international level,” he explains. Born and brought-up in Manjur, a village near Somvarpeth in North Coorg, the champion greets you with a kind smile holding his daughter in his muscular arms sporting a tatoo of a tiger. Unlike the usual assumption of karate champions with rough looks, this average-height man has a gentle look on his face. As Prasad grew up the childhood dream to become a fighter lay in some corner of his heart as various other issues became his priority. He went to Hassan for his higher secondary schooling and then came to Bangalore from there. His childhood desire was always alive and Bangalore gave him hopes to fulfil it. Luckily while working at the airport he got in touch with Sensai Shaji, an ex-Army man who took Karate classes. Prasad immediately joined the classes and used to attend one batch for two hours everyday. His coach was soon impressed with his performance and called him to attend two batches a day. “I used to spend more than 6 hours practicing Karate,” he says gladly. He soon got his first Black belt in 1998. 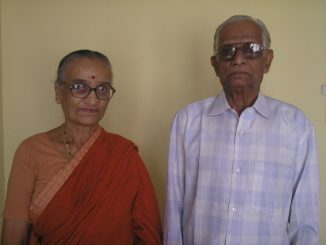 Later he joined another master, Manmohan Suvarna, in Mumbai. Suvarna trained him till 2001. This was the year when he got his first International Black belt. In Mumbai he met Vetrival, another Karate Master from Chennai who offered to coach him. “Vetrival has been one of the biggest supports for me till date. Even now I go to Chennai once every month for a few days for coaching, if I’m not able to go he comes down to coach me here,” says Prasad. Till 2007, Prasad was getting Karate coaching along with his job. I was participating in championships as well as coaching some students in Karate. In 2007 I got an opportunity to get trained by Kunio Miyaka, coach from Texas. “I decided to quit my job and I wanted to totally concentrate on Karate. My wife and mother were not in full support of this decision but eventually they agreed to it. The same year I started my own institute for Karate- the Zen Matial Arts Academy,” says Prasad with pride. His journey to success had begun. He selected some of the boys who were learning with him and were equally dedicated. He started off with a team of 8-10 boys and today he has more than 400 students in Bangalore, Hyderabad, Chennai and even in Kerala. He also has around 60 students in Colombo out of which seven are Black belt holders. Talk to him about if he has used any of his skills in real life and he laughs, “I’m not into all that, I live a peaceful life and never indulge in fighting with people.” He adds that for a good player the best thing should be self-discipline and understanding that the sport is not for enjoyment and hurting people or showing strength everywhere. As he looks back to his file of certificates his five-year old son returns from school, jumps up to his father, shows him a Karate move and says, “I want to be like Papa.” Prasad looks on and smiles. First, Second and Third grading respectively for 2001, 2002 and 2003. 2006: higher training in London and Dubai. Funakoshi Cup Karate Championship held in Bombay (eleven countries participated). Trained by International Masters like Ken Zo(Japan), Takasi(Canada), Kinana Pedly (UK) Suzuki(London) and Sensai Hary Cook. Learnt Tai Chi from master Wang Chu from Malaysia. The ongoing Ranga Shankara Theatre festival has many goodies in store for the city’s theatre buffs. This year’s theme focuses on the Company Theatre era.